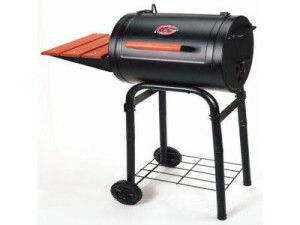 The Char-Griller 1515 Patio Pro Model grill is a product which you can now easily obtain in the market. This product is manufactured by Char-Grill, and they have also installed some safety features, such as the stay cool wooden handles that prevent you from getting burnt and even large drawer for easy cleaning and refueling, and also has one year warranty. The char-griller makes you conserve charcoal. This grill is made of heavy steel that can withstand the weather. It has an ash drawer that you can easily pull out, which helps make starting up the fire and even getting rid of the ashes easy. You will find that it is very well-built and rests high off the floor. Another good feature is that on the front of the cart it has wheels, making it an easy task to lift the rear and move the grill. This equipment is simple to use and clean, and it has a rustic appearance. Also, the shelf and wooden handle is likewise high quality so you will not see rust or even the paint chipping. The legs that support the Char-Griller 1515 Patio Pro grill look fragile, as they are manufactured from extremely thin steel, and are loose on the axle, causing the wheels to wobble. You will also discover that the bottom itself wobbles, in view that the reinforcement bars do not fit well to the legs in a position that is properly locked. You will discover that the instructions are not well put together, making it difficult to assemble the product. You may have a bit of difficulty with the vents at the start achieving the correct temperature when you are grilling. You will find that the mounting of the dampers is designed badly. The opening is very small; therefore, you find it difficult to adjust the elevation of the grates. The grates are obviously the weaker link with the grill, and also char-griller provides you with no warranty on them whatsoever. The Char-Griller 1515 Patio Model Pro is a great product is a must have for those that love barbecuing, for it is of high-quality and it is easy of use. You will find that its firm structure makes this product convenient to carry, and an ideal option for your outside food preparations. Enjoy special moments with friends and family preparing delicious meals with the help of this product.